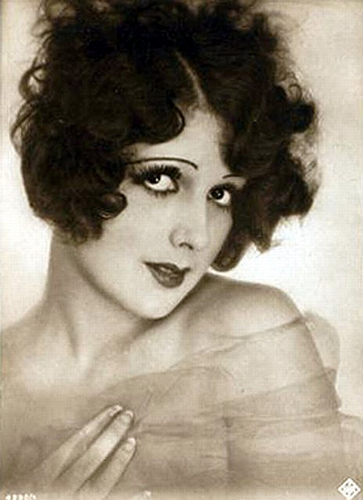 The lovely Betty Amann – notice her very waxy eyelashes and downward sloping eyebrows! 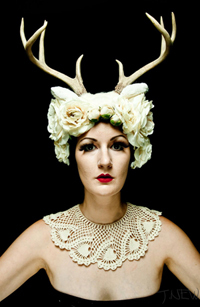 When I was younger and not quite living as a full blown Vintage Vivant (that is, dressing in vintage styles every day) I used holidays such as my Birthday, New Year’s Eve and Halloween to dress in full vintage and emulate different glamor stars. Around this time of year, I would start mining different vintage fashion sites in search of 1920s flapper makeup tutorials. My favorite part of reading about vintage makeup is exploring the different tools and products that were used to achieve such theatrical looks. Unassuming items like kohl, petroleum jelly and rouge can send a face from a Plain Dora to Jazz Baby in a matter of deftly placed strokes of a brush. It’s all a matter of knowing where to paint! 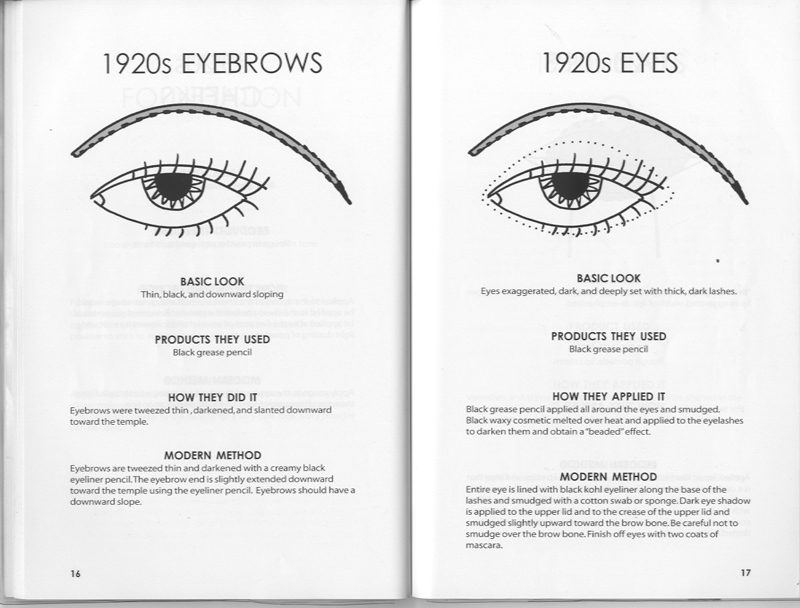 The book shown above, Vintage Face: Period Looks from the 20s-50s, is fantastic – it’s a contemporary book but I believe it’s out of print. I find it very helpful that the materials/methods from the 1920s are juxtaposed with the current methods. Beseme Cosmetics, purveyors of vintage makeup, has some excellent video tutorials on how to apply blush, and cake mascara. 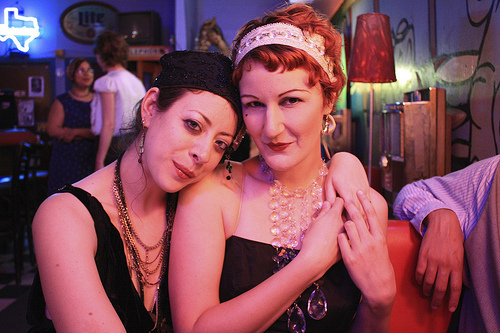 Kevyn Aucoin’s Making Faces book also show flapper, gamine and Edith Piaf looks to emulate. This video is from the Helena Rubenstein site and it’s quite amazing! 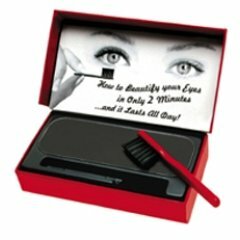 My favorite vintage product is cake mascara! I remember playing with my grandmother’s cake mascaras and eyeliners when I was a kid and using them to paint whiskers on my face like a kitten. It’s half wax, half pigment. You must dip the brush in water in order to activate the mascara. Paula Dorf Cosmetics and Lola Cosmetics both produce a cake mascara that I’ve tried. However, they are seldom sold in stores so your best bet is to find them online. Applying mascara with a little toothbrush seems daunting at first but it’s quite fun and more of a natural tint than real volume. No matter how closely I follow a tutorial I feel as if my look is lacking something. 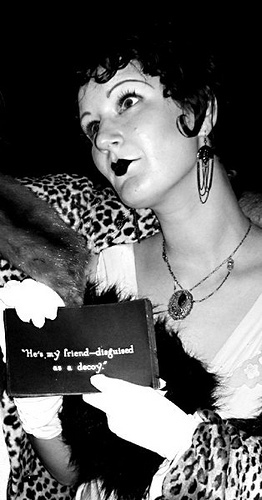 Here I am last Halloween as a silent film star. Literally, I was a silent film star, I didn’t speak a word! I watched about 9 silent movies through the course of October and photographed all of the title cards in the films. I printed out the title cards and carried them around all night. I would shuffle them up and then answer people randomly with the cards. It was like Mad Libs starlette! I put these two photographs up for you to see the difference in the look from color to black and white. In the color photo, observe how my eyes are heavily made up but how they look more plain in the black and white photo. I was discouraged with this result because it seemed like the more I made myself up the less it transferred to “Starlette” in the black and white version. 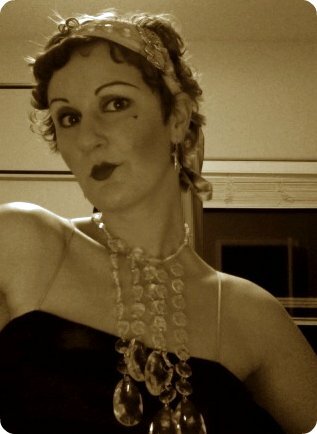 Left: Here I am in my room before the last “Party Like it’s 1929” party. I had just gotten my new iMac with built in camera the week before, and as I was doing my makeup I had a revelation: why not turn on photobooth and do my makeup in the sepia setting? I tried it, and the results were amazing. I felt that because I stripped down the colors I was really able to focus on the shadows and highlights. Right: Here is Angel and me at the big event – aren’t we sweet?